I have a refreshing little salad recipe to share with you today. You’ll find it especially timely if your garden is producing more cucumbers than you know what to do with. Light and refreshing, crunchy, sweet and juicy, the combination of cucumbers and melon is very appealing on a hot summer day. Have you ever had or seen melon combined with cucumber? It was a revelation to me when I first sampled it last summer at Pane-Bianco sandwich shop here in Phoenix. A simple salad of sliced cucumbers and cubed melon tossed with a bit of lemon juice and olive oil, it was refreshing and satisfying. I thought the creators of what seemed to me an unlikely combination that complement each other so beautifully were brilliant. So, imagine my shock to discover a nearly identical recipe in my old Betty Crocker cookbook, 1978. The more you study food the more you come to appreciate that that there really is nothing new under the sun. One thing I can count on: as summer progresses, I become less and less interested in cooking, opting for more and more “no cook” dishes like salads and sandwiches. Fortunately, the abundance of fresh fruits and vegetables this time of year makes it easy to get good-for-you food on the table with minimal time in the kitchen. And with few calories and SmartPoints too. Which is why for many folks, summer is the easiest time of year to lose weight. This simple melon cucumber salad is easy to prepare, provided you have a sharp knife. Just a few basic ingredients and you’re good too go. If you have thin skinned cucumbers from your garden or the English (hothouse) kind from the supermarket, you’ll even be able to skip over peeling the cucumbers. Feel free to get creative with your melon cucumber salad. 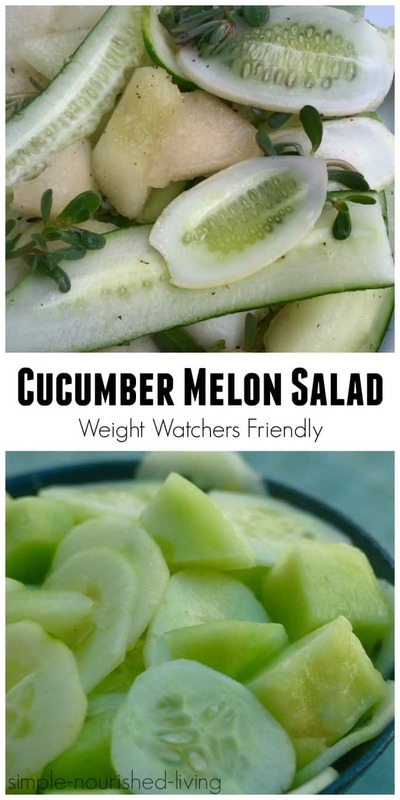 Use whatever melon – honeydew, cantaloup, watermelon – you prefer. Keep things simple, or get fancy with the addition of a little feta cheese, sliced radishes or chopped fresh mint. According to my calculations each serving has *1 SmartPoint and works with Simply Filling provided you count the oil in your daily requirement. Enjoy! 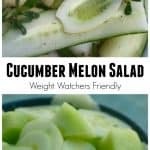 If you like this easy cucumber salad with melon, be sure to check out my other easy, healthy Weight Watchers friendly recipes including Chilled Avocado Cucumber Soup, WW Simple Cucumber Salad, WW Orange Cucumber Salad (Simply Filling), Simple Chilled Cucumber Soup and Watermelon Feta Salad. A unique combination, simple, light, sweet, savory, crunchy and satisfying. Perfect for summer with just 1 WW SmartPoint. In a large bowl, stir together oil, lemon juice, sugar, salt and pepper. Toss dressing with cucumber and melon.